The Easter Bunny is hopping into town. Bring the kiddos and their baskets to get in on the best Easter Egg Hunts around Atlanta this year! Brookhaven Easter Egg Hunt at Blackburn Park. Breakfast treats at 9 a.m. 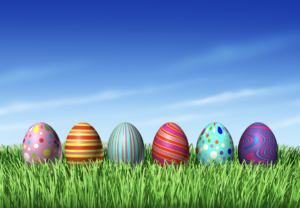 Egg hunts by ages start around 9:30 a.m. with three different start times based on age groups featuring prizes, candy, a bounce house, face painting and a special visit from the Easter Bunny for photo opportunities. 3493 Ashford Dunwoody Road, Brookhaven, GA 30319. 404-637-0534. Free. Click here for a google map! The Peters Company is a top producing team of real estate specialists serving the needs of sellers, buyers, and investors in Metro Atlanta and North Georgia. These free (and highly detailed) reports will give you access to professional real estate reports and market outlooks. No Thanks. I don't want VIP updates. Stay Updated! Get Georgia's Latest Real Estate News and Updates Before Anyone Else.